At the Rock Garden, no one will tell you what to do. 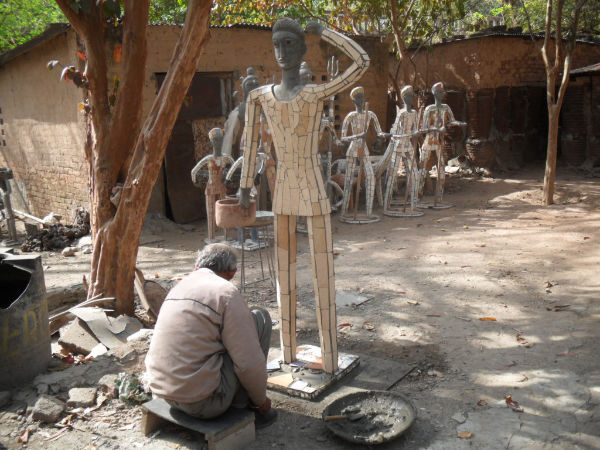 You need to find your own work, though check with Nek Chand before starting. Initiative and willingness are essential. Start by walking around the Rock Garden, both the public and non-public areas. In the next few days, perhaps try cleaning tasks. These activities have three advantages. 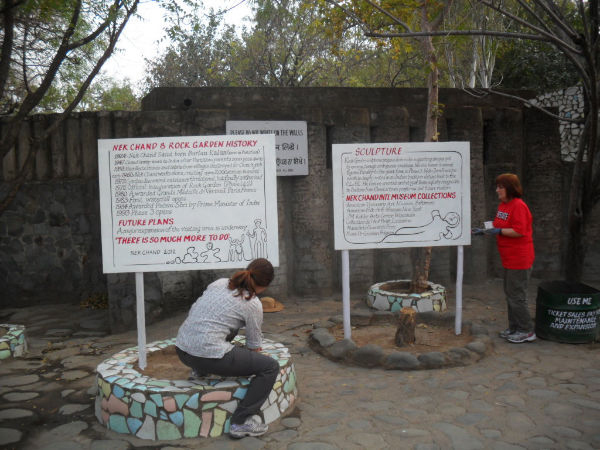 First, they allow volunteers to get to know the Rock Garden, its staff and its visitors. 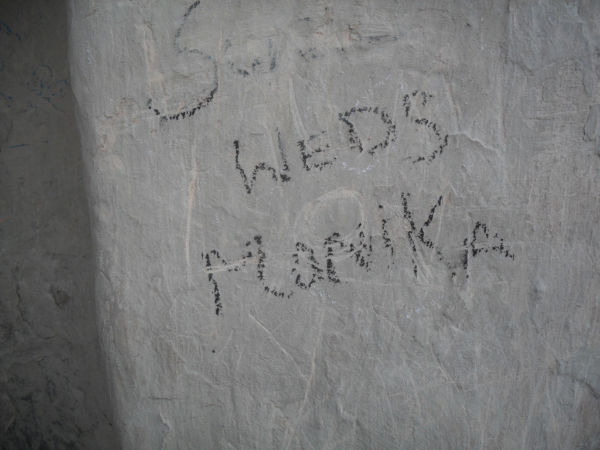 Litter is everywhere, though graffiti and weeds are in specific places. Staff will soon get to know you when they see you working. Visitors will notice you and engage you in conversation. Second, this work immediately improves the appearance of the Rock Garden. Third, foreign volunteers doing such humble jobs and sending a public signal that the Rock Garden is of international importance and deserves respect. All these jobs need gloves to protect your hands from rough concrete or cement powder. A trowel is needed for weeding – bring your own or buy one from Sector 9 ironmongers, Rs. 15. Gloves Rs.40 pair (sold individually). Children’s fishing nets are useful for collecting rubbish from ponds. 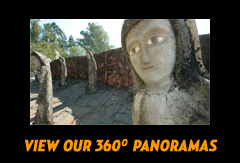 This is an important activity because Nek Chand wants more sculptures for Phase 3 of the Rock Garden, and making sculptures is exactly what Nek Chand himself and his many workers have done for more than fifty years. That is to say, the hands of the volunteer sculptor go to the artistic heart of the Rock Garden. Of course, the hands should have gloves on because concrete powder will take your skin off. Also protect your hair [unless you want a very set hairstyle], and nose and mouth with a scarf or bandana. A mask would be required in the UK. Do not be fooled by the lack of protection of local workers. They have suffered. Making sculptures starts with making steel frames set in a concrete base. 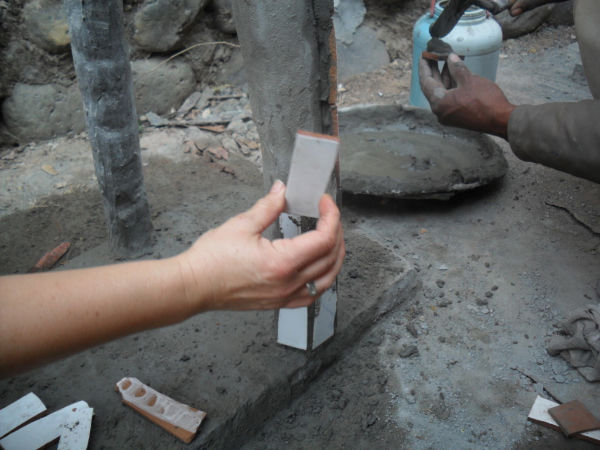 Layers of masala (concrete powder and water) are then applied, some by hand, some by trowel. When dry, each layer is scraped by trowel. This is hard physical work and not easy at first. Experience of plastering may be an advantage. Faces are sculpted with a trowel, and this takes skill and patience. Sculptures are clad in broken tiles. Tiles need to be clipped to fit and then are pasted with masala, which also acts as grouting. Expert workers may make two life-size figures in two days, with drying times overlapping. Apart from gloves, hats, and scarves, good tile clippers and small trowels are needed. There are many possibilities for mosaic work either repairing existing mosaics or adding mosaics to large walls. Mosaics are made of broken tiles, of which there are many in non-public areas. Tiles need to be clipped to fit and are pasted with concrete and water masala. There are many other potential work projects. 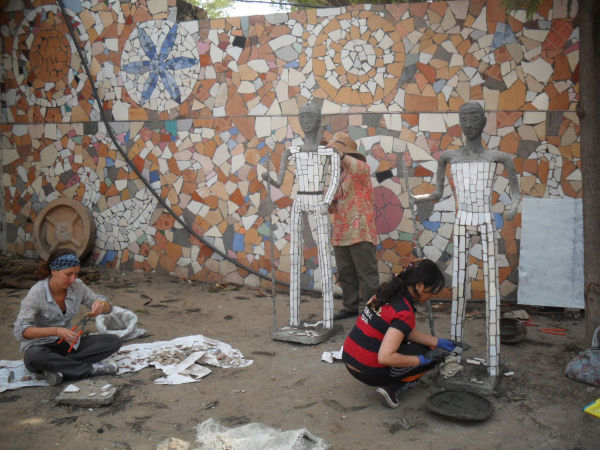 Previous volunteers have painted shop booths, created signage, carried out surveys, cleaned water pools, made investigative visits to other sites with Nek Chand sculptures, and repaired damage to walls and sculptures in public areas. 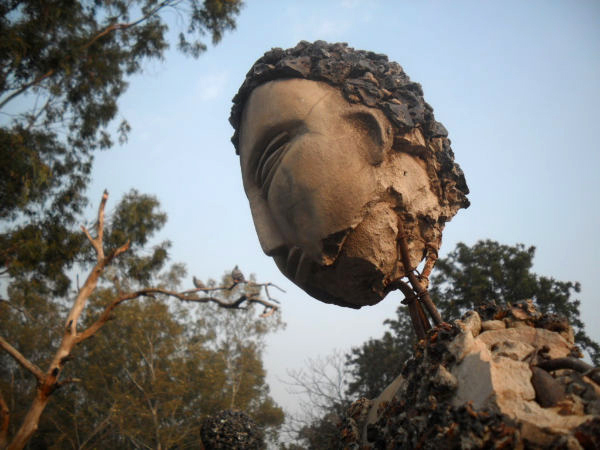 Projects should be feasible within the time available and agreed with Nek Chand. If possible, projects should be those which Rock Garden workers are not easily able to do because of lack of tools, time or resources. There are many very physical projects but potentially others less physical such as documentation and record keeping. Permanent Rock Garden staff generally work from about 8 am to 12 noon, and between 1 pm and 5 pm, seven days a week. This includes sculptors and sweepers, who live on site in basic accommodation. Other staff, for example, shop keepers and tourist police, live outside the Rock Garden.